If there’s one place that’s just as much a melting pot of cultures as Singapore, it’s the capital city of the United Kingdom. The London food scene just keeps getting better and better, which is why it’s one of the top holiday destinations for Singaporeans. And as a Singaporean living in London, I can safely say that you can take the girl out of Singapore, but you can’t take Singapore out of the girl – I may be thousands of miles from my sunny hometown, but I still love a good bargain. London’s a lush destination but it’s not exactly cheap. I mean, just compare the pound to our Singapore dollar… you see where I’m going with this. 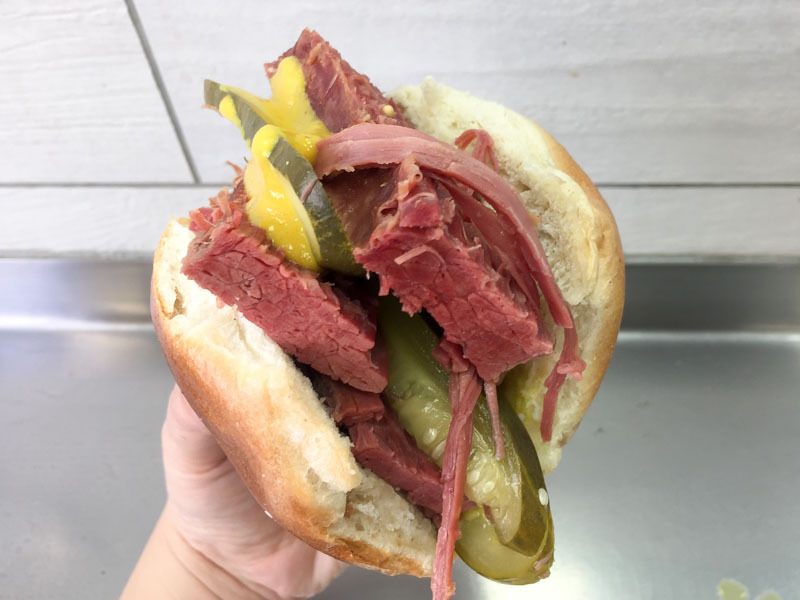 That being said, there are loads of food spots around the city that serve value-for-money grub, and Beigel Bake is probably the most famous of them all. 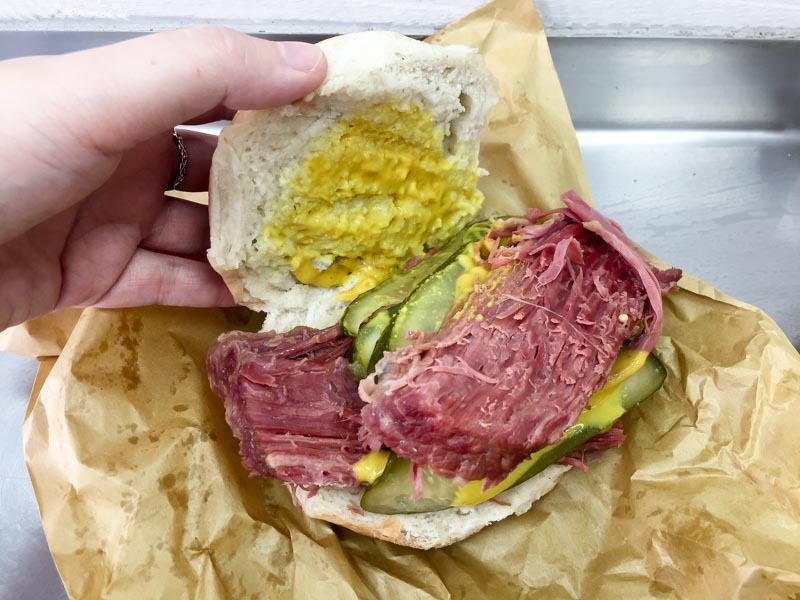 Located along popular Brick Lane (known for cheap curries and hipster cafes), the bakery has been serving up pastries and hot bagels (or beigels) since 1974 – the most iconic one being the Salt Beef Bagel that’s put this London takeaway joint on the map. 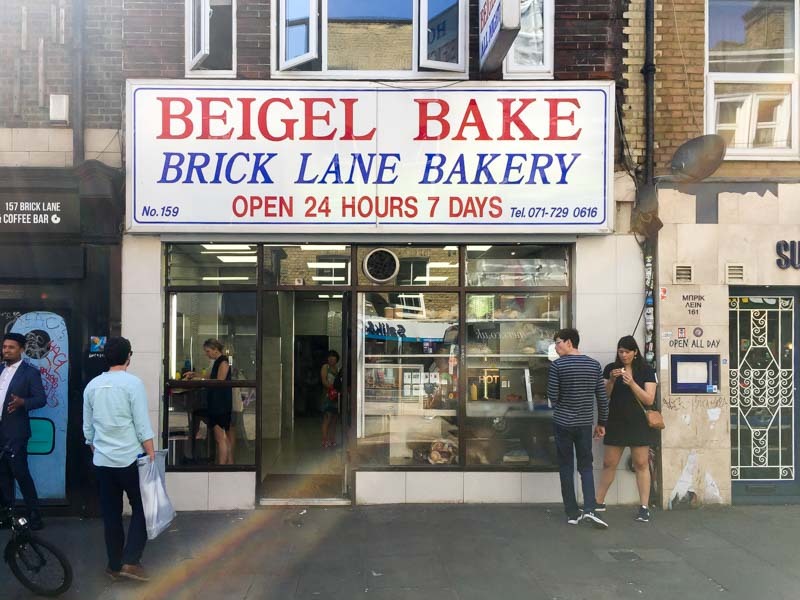 The baked goods are made in the traditional Jewish style, since the bakery is owned by a Jewish family who set up shop way back when Brick Lane (and the surrounding area) was still home to a large Jewish community. 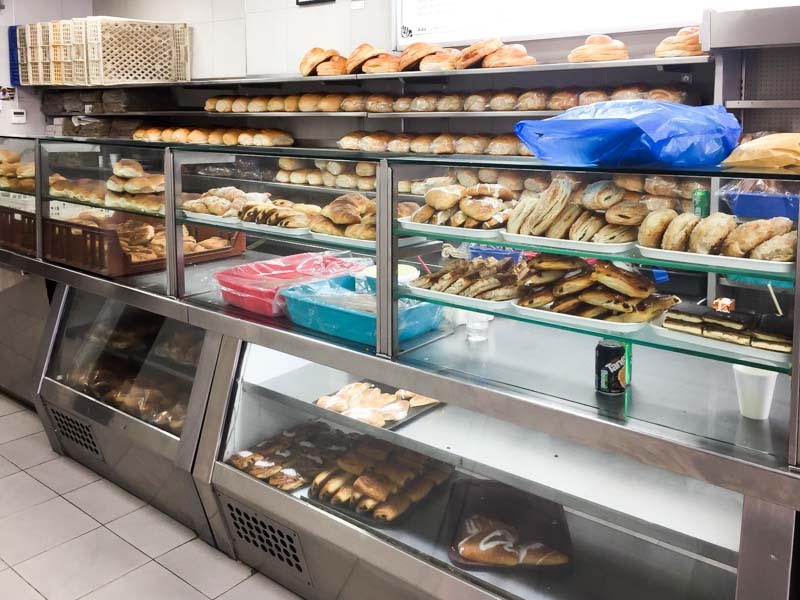 The bakery produces about 7,000 bagels every day, making that the bestselling item. But you’ll also be tempted by loads of affordable sweet treats like Eccles Cakes (£0.80, approx. S$1.40) and Apple Slices (£0.70, approx. S$1.25), as well as an assortment of freshly-baked loaves of bread. Don’t get distracted though – the main event will already be calling out to you from the shop window. 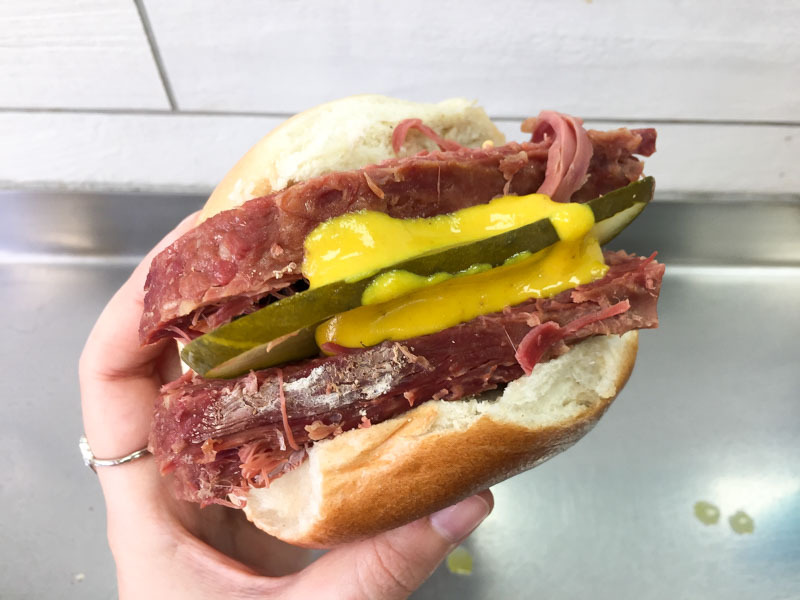 The Salt Beef is currently the most popular bagel filling, and you’ve probably already seen it making its rounds on social media. Head inside the old-school bakery and get the attention of one of the ladies ONLY when you’re ready to order. 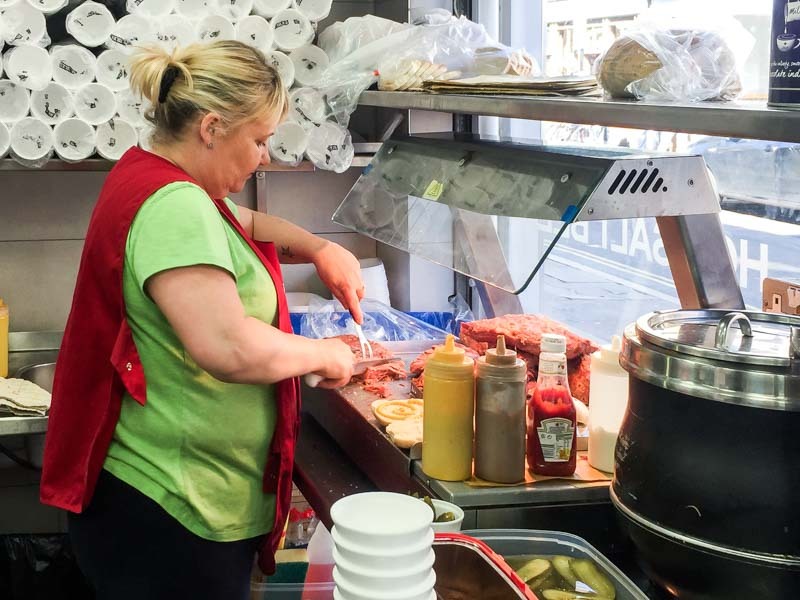 A word of advice: Don’t dilly-dally; it’s a takeaway joint so the service is brisk and pretty constant. Hmm-ing and umm-ing will only back up the queue and probably earn you some glares. Now back to this glorious beef filling – cured beef is stewed for five hours before it’s displayed, ready to be cut up and served. 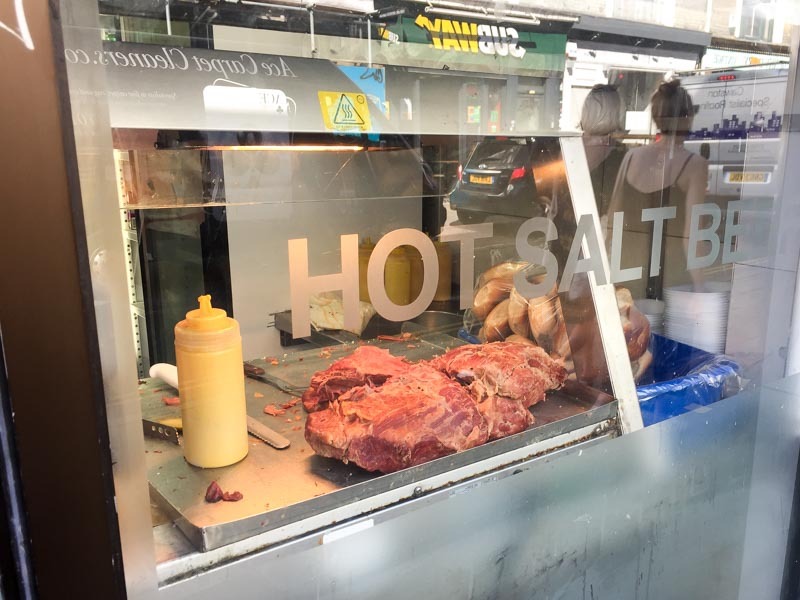 I was lucky to be there when a new batch was just rolled out, and I quickly made my order for one Salt Beef Bagel With Mustard & Gherkins (£4.50, approx. S$8.10). 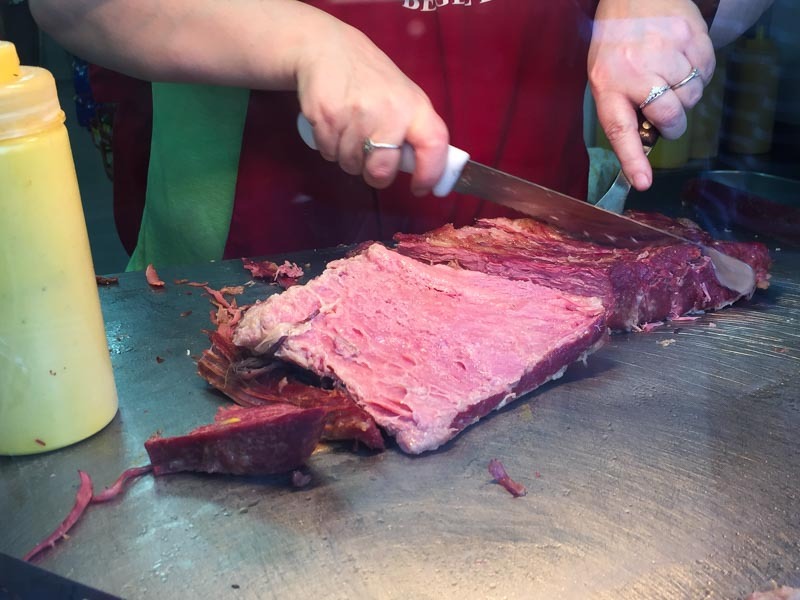 A fresh bagel was whipped out, cut in half and filled with chunks of Salt Beef. And boy, was it filled. For only £4.50, which is cheap by London standards, I got this monster of a bagel sandwich that was literally dripping with goodness. The mustard and gherkins are classic accompaniments, but if you’re not a fan, make sure to be clear when you order (it’ll only cost you £4.20, approx. S$7.60, without gherkins). There’s no seating in the bakery, but there is a table that runs along the wall across from the counter, and that’s where I perched to stuff my face. I took a big bite out of the beef bits sticking out first. The brisket obviously tasted briny (due to the salt), but not in an overwhelming sort of way. It had a robust, meaty flavour and was super tender with just the right meat-to-fat ratio. After a few more bites, I came to the conclusion that I wouldn’t have enjoyed it as much without the sweet-sour gherkins and mustard, which really helped to cut through the saltiness and create very harmonious flavours. The bit of heat from the mustard also elevated the bagel sandwich and satisfied the Asian in me (yes, I’m the kind who loves everything spicy). The bagel itself was pretty tasty and quite unique; Beigel Bake boils their bagels in water before baking, producing the crispy texture on the outside, and the chewiness in the middle. If you’re finding it too chewy, it’s most likely because you’ve never tried a proper Jewish bagel before. The only thing I would say is to enjoy the bagel while it’s hot. Dapao-ing to have it later may make it slightly chewier and prove a bit of a workout for your jaw. Oh, and don’t forget that because this is on the other side of the world, temperatures differ and food goes cold faster than in Singapore. 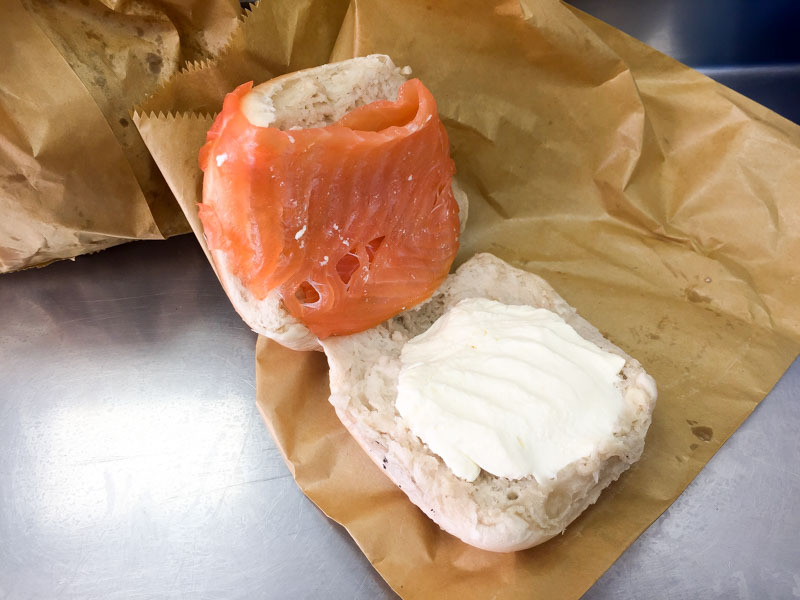 Salt Beef may be the popular filling now, but back in the day, the Smoked Salmon & Cream Cheese Bagel (£2, approx. S$3.60) reigned supreme. So, of course, I had to try one, and at half the price of the Salt Beef Bagel, it was even more affordable. You definitely get what you pay for, so there wasn’t as much filling as the Salt Beef, but the helping of cream cheese was really generous and there was enough smoked salmon to fill every bite. 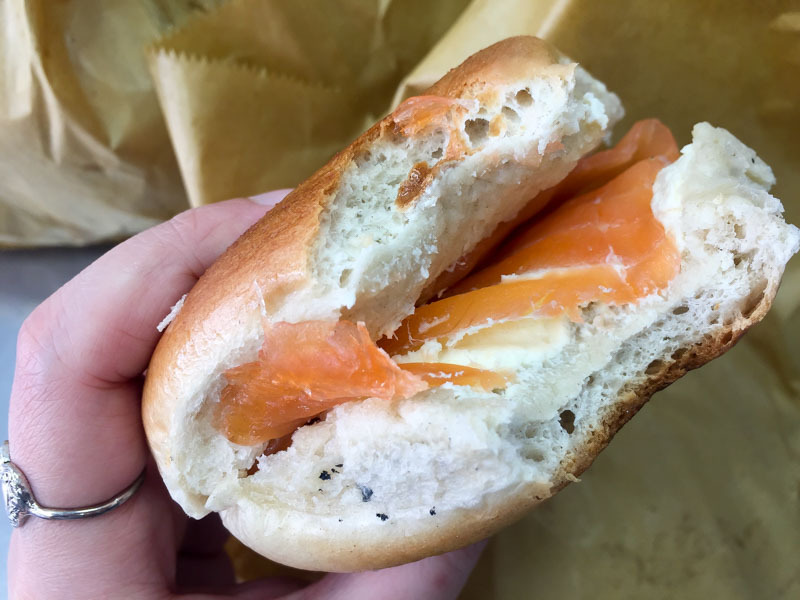 This bagel tasted as fresh as the previous one and I don’t think you can really go wrong with the classic combination of smoked salmon and cream cheese. Here’s a little inside tip from your homegirl: sometimes the bagels are served cold (like in the case of this particular filling), but those in the know just bring the bagel to the back of the shop and kindly ask for it to be heated up. You’re welcome. This bagel combo tasted much nicer when warm, and was easier to eat in terms of the chewiness. 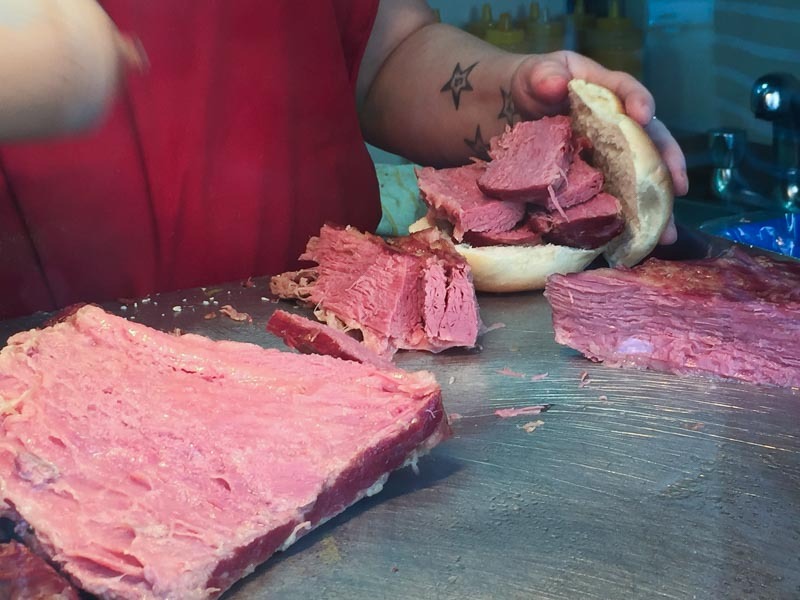 If you’re only going to get one bagel when you’re there though, it should hands-down be the Salt Beef one. 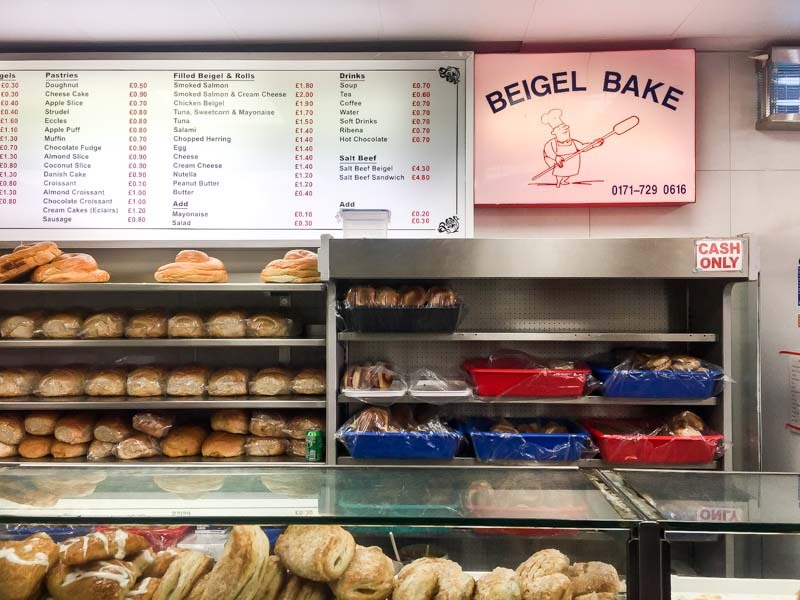 Beigel Bake has become a go-to hotspot in London for a quick lunch or a snack at any time of the day because it’s open 24/7. There’s another bagel shop right beside it (and owned by the same family actually, but that’s a whole other story), so just take extra care to make sure you’re in the right one. 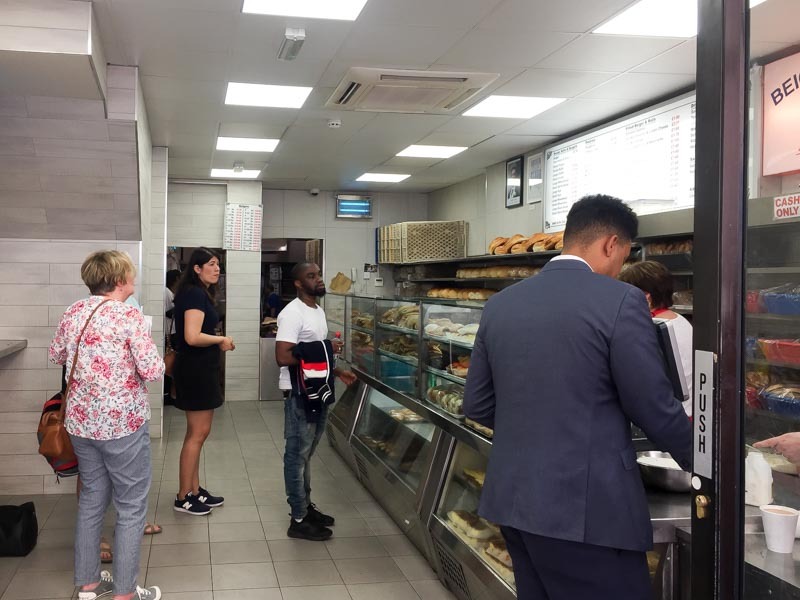 The delicious bagels are truly value-for-money and since you’re probably going to visit Brick Lane for all the other shops and London vibes anyway, drop by and try it for yourself!